This screen can be found on the 1st floor by the L121 Computer Lab. 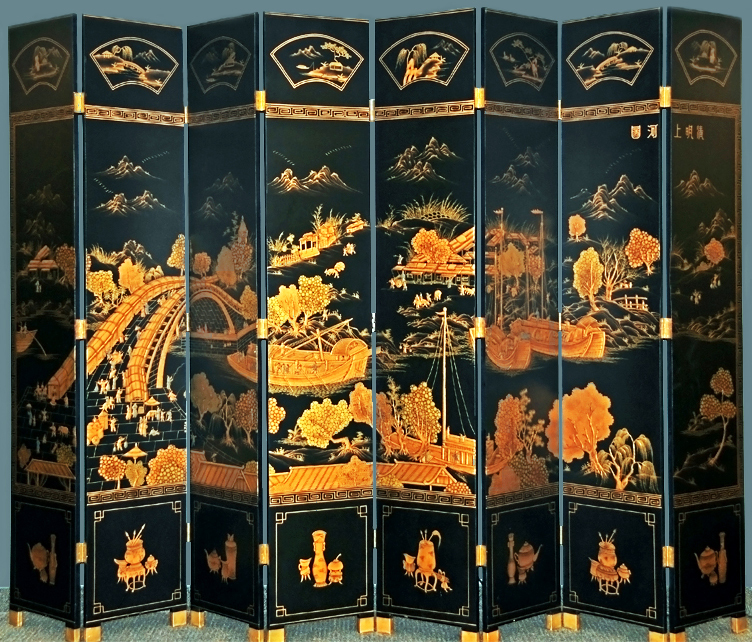 Based on the highly revered original "Along the River During the Qingming Festival" created by artist Zhang Zeduan during the Song Dynasty (c.1085-1145), the screen captures the daily lifestyle, clothing and architecture of people from the period and celbrates the festive spirit of the Qingming Festival. Several reinterpretive replicas have been created by court artists of subsequent dynasties and each version follows the composition of te original, however the details vary greatly. The translation of the original Song Dynasty title have been disputed by scholars over the centuries from "Going Upriver on the Qingming Festival" to "Peace Reigns Over the River"; likewise, the city depicted could be the Kaifeng of today, but many believe it to be an idealized, non-existent city. The content of this particular screen depicts a similar scene in which the countryside and densely populated city are the two main sections, with the river meandering through the entire lenght. The right section depicts the rural countryside with travelers on foot carrying their goods on the path to the city, farmers tending their crops and livestock and boats on the river lining up to dock. The left section shows a stone bridge leading to the city with where villagers of all walks of live and economic status are represented. Vendors, peddlers, entertainers and teahouses beckon the diverse travelers who transport goods by mules and aristocrats carried in their sedan chairs. Workers along the shore guide a large boat safely under the bridge.